Patio space is at a premium for all bars and restaurants. A lot of work goes into maximizing the space to fit the right number of tables and patrons so that you can give them the experience you want to create. Traditional umbrella stands get in the way of all of that hard work. Their bulky bases take up a lot of space and are hard to move. Often, they force you to place your umbrellas in areas which don't properly shade your patrons and just plain 'get in the way.' The MoreSpace Umbrella Stand takes up very little room and is easily moved from location to location. Maximizing the number of happy people on a patio is paramount to your business. The MoreSpace umbrella stand takes up less than 4 inches of floor space, compared to two or more feet of space with traditional umbrella stands. This means you can fit more tables, more people, and make more money. The MoreSpace umbrella stand sets up in minutes using only a common drill. All of the other parts you need are included, including the drill bit, anchor and stand. No expertise is necessary to install the MoreSpace stand. During the off-season, the MoreSpace stand easily twists off its anchor and can be stored inside and reused again the following season. Traditional umbrella stands are big, bulky and costly. The MoreSpace umbrella stand, thanks to its small dimensions and innovative anchor system, costs less than half of a traditional umbrella stand base. The MoreSpace umbrella stand is built with tough reinforced industrial grade materials so that your umbrella stays put even in rough weather. 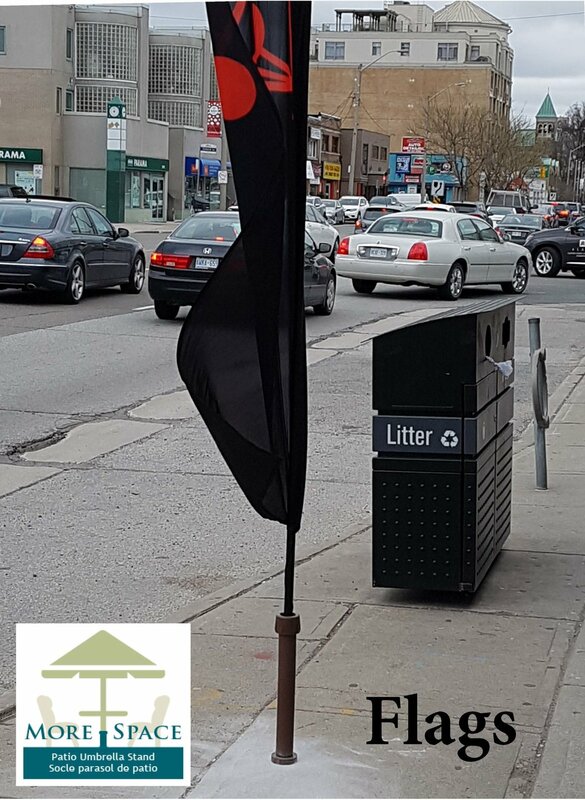 Traditional umbrella stand bases have problems keeping the umbrella in place if knocked or in high winds. The MoreSpace stand is firmly set in place and holds your umbrella tight.